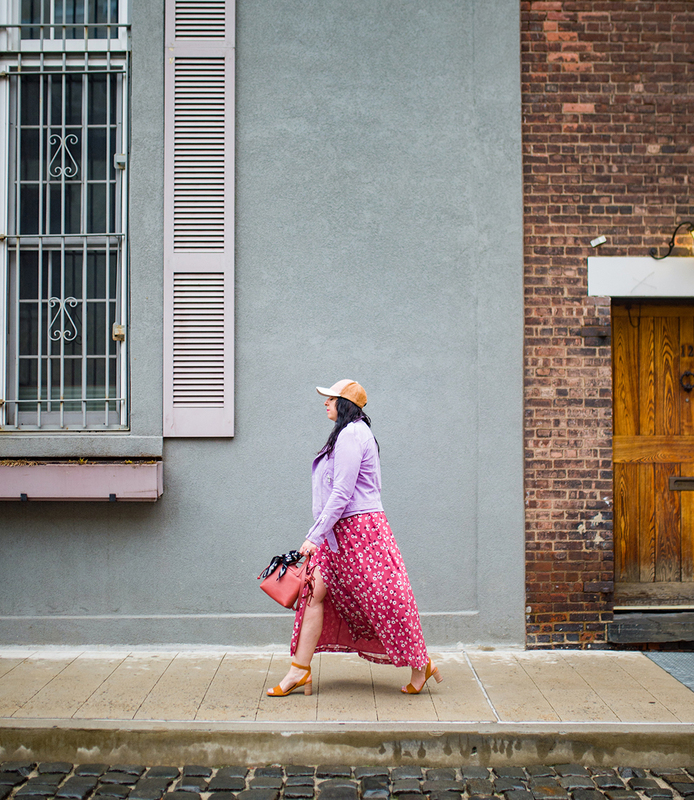 This outfit post about Making my way with Madewell and the Madewell April sale promo is sponsored by Madewell. Although some of the clothing I’m wearing was provided by Madewell, all opinions are as always my own! Please read this blog’s disclosure post for more info. Late April has finally brought some bloom to NYC. Before the cherry blossoms arrived it was up to me to bring some colors to my world! I turned to one of my absolute favorite stores, Madewell, for help. 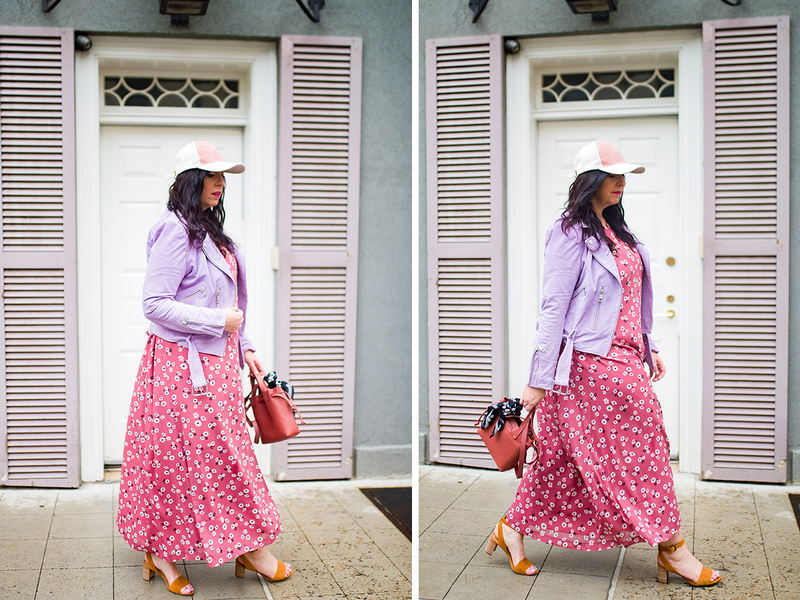 Several items later my closet feels Spring-ready and blossoming! That’s how I’m making my way with Madewell. Right this moment, have you taken a look at the Madewell April sale promo? I spoke about it in yesterday’s weekend report. Also, I’m wearing some items included in the promotion here. More below. This girl loves pink. One of Madewell’s trends this year is monotone — picking one color and sticking with it through an outfit. Sometimes that means mixing tones of the same color. Other times making my way with Madewell means picking a single color tone and sticking to it, like in this look! 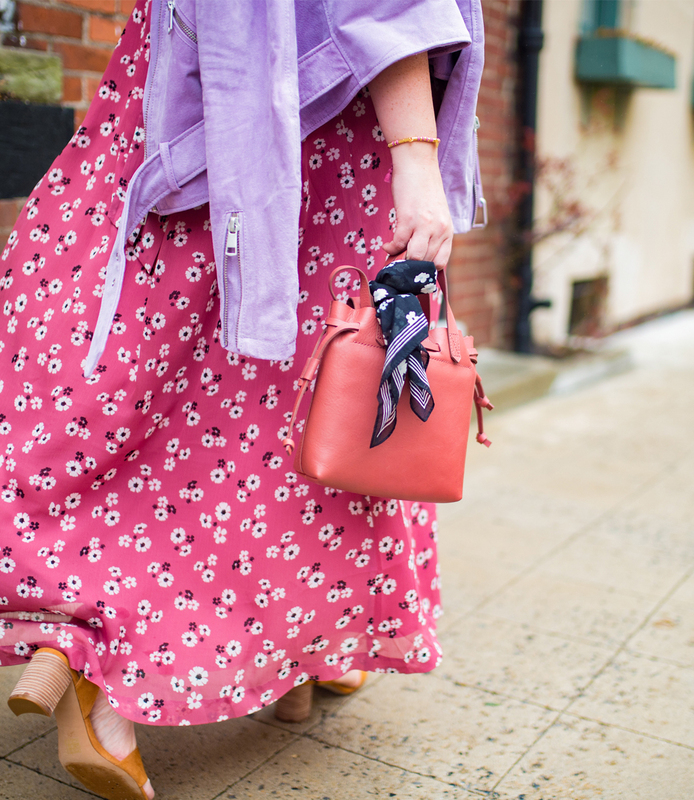 The lovely rose pink of the Tie-Waist Maxi Dress in Vintage Daisy ($168, also available here) makes the perfect foundation color for a Spring outfit. With a bag, bracelet, earrings and lipstick all in the same shade, I’m ready for making my way with Madewell. Some of these items have sold out so quickly! They sold out before I could even feature them on my Instagram in an outfit teaser. The dress sold out immediately (though it does pop back, so keep checking!). The earrings too were gone in a flash. I’ve learned with Madewell that it’s best not to wait on an item that I truly love; it might be here today and sold out tomorrow! The company purposely places small inventory orders on many items, so making my way with Madewell often means hitting ‘buy’ as soon as I see an item I like! I so appreciate that Madewell is now carried by both Nordstrom and Shopbop too. It gives me more chances to grab an item I truly love. Other times, I’m lucky and the item I want will make it to sale. Right now during the Madewell April sale promo you can take an extra 30% off all sale items! (Code: YAY30.) This promo includes my very comfortable sandals and the lovely bracelet I’m wearing too. The dress likely will not make it to sale since it keeps selling out and the bag is a question mark too. Grab them now while you can! Speaking of the bag, Madewell’s Transport collection is such a delight! I’d say this mini drawstring Transport is vital to making my way with Madewell. It’s the perfect size! It holds my day-to-day necessities. Also, I love that I can wear it crossbody or carry it via the shorter handles in my hands. I like it so much I’ve got it in two colors now. Expect to see both colors often in my upcoming OOTDs! The bag is included in the Madewell April sale promo! Also, there are other cute bag options to choose from. Madewell has such an eye for updating vintage details in modern cuts, lending an air of both timeless classic appeal and fresh modern feelings. My dress (also available here) is a perfect example of that. It’s long and dramatic with its flowy skirt that dances beautifully in the air. There’s a top button at the keyhole (which I prefer to leave undone) and a beautiful tie detail in the back. 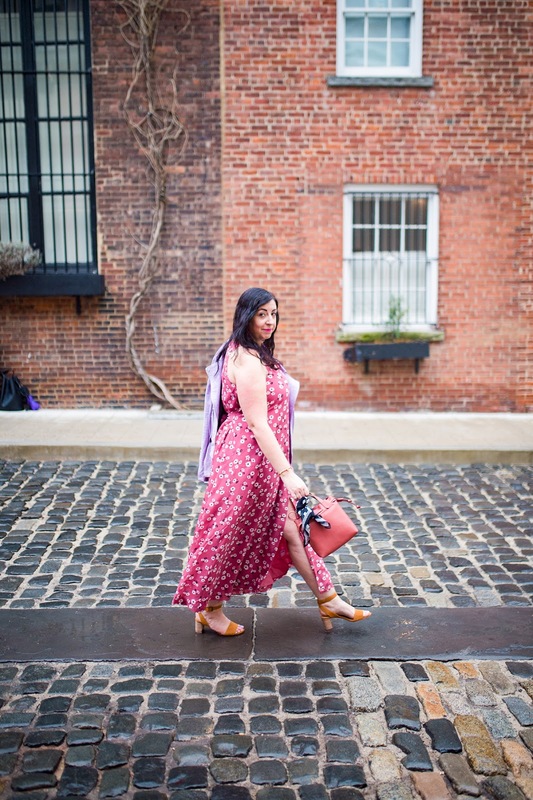 Overall this dress is maxi perfection. 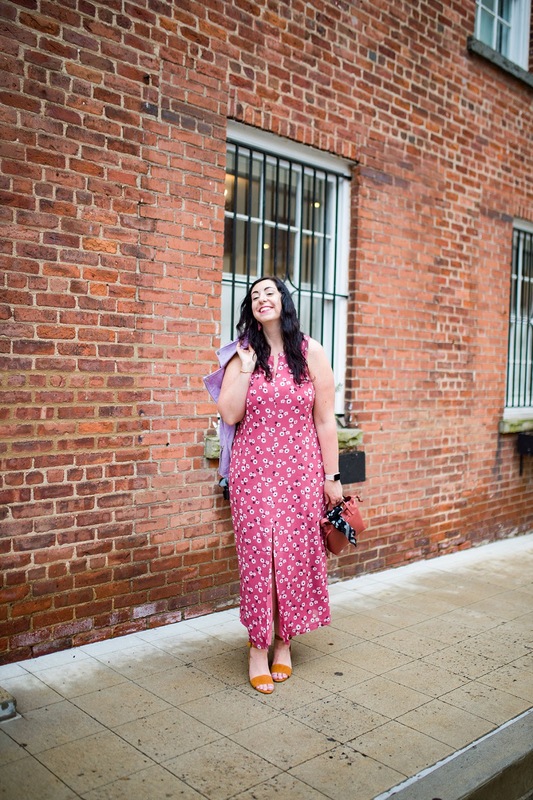 I love making my way with Madewell in pretty dresses like this! It’s not included in the Madewell April sale promo but on Monday, I’ll feature a dress that is. Below, my picks from the Madewell April sale promo. What’s your favorite Madewell item right now? Also, have you seen my weekend sale roundup? I ordered a bunch of sale things earlier this week! I am really loving Madewell these days. I like the daisy embroidered jeans but just can’t do 11inch rise with no stretch. Haha. Love your dress. Might have to put that on my wish list. Me too PHG! What did you order? Do you have a favorite item you're really looking forward to? I am very in love with this dress, highly recommended. Love this dress on you! Great post! I love your entire outfit! I’m considering purchasing your bag since it’s on sale. Which color do you recommend? Can it hold everything I need for my day? Thank you kellclear22! I like this pink color a lot, but there is a light green color that I find myself reaching for more often. It looks very good with my military and denim jackets. So if I had to pick one color it'd be that one. You'll see it in an OOTD tomorrow! As far as holding everything, I can fit my wallet, sunglasses, and phone in there no problem. Chapstick too. A long wallet (like a checkbook sized one) would be too tall for this bag. You look so beautiful in these photos! The dress is spring perfect and I loved your picks! You def have to move fast with this sale because things go QUICK!! So true! Thanks so much Ilse! Madewell is one of my favorites, EVER! So many good Spring pieces out right now. It's one of my favorite stores right now too. Madewell never disappoints when it comes to their clothes and accessories and really just everything! I have been loving their bandanas and bags right now. Thanks for sharing! Agreed Lydia! This bandana does so many great things.Looks great no matter how I wear it! I love Madewell!! So many good items that it is hard to choose!! I totally agree, it's overwhelming how much pretty stuff they have! This look is flawless! I love it all so much!!! Thank you so much Ruthie! Totally delighted to hear that. I do really like Madewell, but I haven't check out their sale yet. You look fabulous in that dress — loving all the Madewell bags. Thank you! It's so hard to choose from all their great bags. Love Madewell! My mom and I actually did lots of shopping there today. They have so many great items and the best jeans! Love this look on you – so fun and fresh. That's so awesome, you must have such a stylish Mom! Their jeans are among my faves. Madewell is the best! Looks like some awesome deals. Yes it was a fantastic sale! Hope you picked up some good stuff. Such a cute outfit babe! I am loving this dress, the color and print looks amazing on you! So true Hannah! Thanks lady!! Love the fun floral print of this dress and I am a huge fan of Madewell's style- so effortlessly chic! You look amazing in this dress! I am loving the print and the bright color. So many great picks too, I need to do some shopping quickly! I love the mix of red and pink! It's so perfect for spring. Thats a lovely ootd.. Madewell has some great pieces!